An expanding world population, extreme weather patterns, and industrial pollution are making water a scarce commodity. Opportunities exist for businesses that can figure out how to keep the pipes flowing. Agriculture consumes 71% of all water globally. An irrigated field in Spain. With all the bottled water we swig and showers we take, you'd think individuals consume the most water. 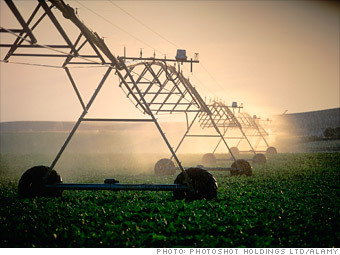 Actually agriculture accounts for 71%, and industry 16%, of all water use globally. A pair of blue jeans requires 2,906 gallons, most of it from growing cotton. A car requires 104,000 gallons, most of it from the rubber. It takes 71 gallons of H2O to produce a tall cup of coffee. Starbucks plans to cut its in-store water usage by 25% by 2015 with, for example, espresso machines that dispense less water. Climate scientists and their billionaire backers are trying to turn down the global thermostat - and make money doing it.